This PDF 1.5 document has been generated by Microsoft® Word 2013, and has been sent on pdf-archive.com on 04/07/2014 at 08:12, from IP address 117.211.x.x. The current document download page has been viewed 401 times. Reynolds number for all the walls. enhanced turbulent heat transfer in a channel with periodic ribs was carried out by Tsai et al. .
decreased heat transfer as a function of surface curvature and flow rates. fourth and fifth sections, respectively. experiments were carried out in turbulent flows. and to obtain flow and wall temperatures, respectively. streamwise direction on the ribbed wall. free stream temperature and thermal conductivity, respectively. than 3% and 4% respectively, using the uncertainty estimation method of Kline and McClintock . number, in good harmony with Gostelaw et al. results. good accord with the results of Thomman . contribution to the heat transfer from the ribs. Figure 4. Local Nusselt numbers over the flat, concave, convex and ribbed walls at Rex=3.1x106. was 18% smaller that was similar to those of Mayle et al. . Figure 6. Variations of Nu/Nuf with Rex over the flat, concave, convex and ribbed walls. respectively. The ratios of the ribbed wall are within the Yuan  findings. continuous and truncated ribs”, Experimental Heat Transfer, Vol.18, pp 179–197. rectangular base-plate penetrated by arrays of holes”, Appl. Energy, Vol. 62, pp. 81–95. device heat sink”, Applied Thermal Engineering, Vol. 26, pp 486-493.
a blocked channel for heat transfer enhancement of electronic chips”, Int. J. Heat Mass Transfer, Vol. 54, pp. heated blocks in tandem”, Experimental Thermal and Fluid Science, Vol.16, pp 286-298. Science, Vol. 19, pp 67-76.
turbulent flow over heated blocks in a horizontal channel”, International Journal of Thermal Sciences, Vol. Proc. 14th Int. Heat Transf. Conf. Washington DC, Vol. 14, pp. 1-10. Transfer, Vol. 51, pp 145–154. discrete wall jets”, JSME International Journal-Series B, Vol. 37, pp 403-412.
layer”, Journal of Fluid Mechanics, Vol. 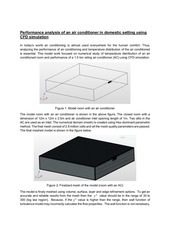 33, pp 283-292.
surfaces”, ASME Journal of Heat Transfer , Vol. 101, pp 521-525.
layer on a mildly curved convex surface”, Turbulent Shear Flows, Vol. 3, pp 80-89.
boundary layers on convex-curved surfaces”, ASME Journal of Turbomachinery, Vol. 109, pp 443-451. ASME Journal of Turbomachinery, Vol. 111, pp 51-56.
curved rough surfaces”, International Journal of Heat and Mass Transfer, Vol. 43, pp 251-262.
transfer on a curved surface”, ASME Journal of Heat Transfer, Vol. 121, pp 22-33. Mechanical Engineering, Vol. 75, pp 3-8.
pressure gradients on boundary layer transition”, Journal of Heat Transfer-Transactions of the ASME, Vol. transverse fin arrays”, International Journal of Numerical Methods for Heat &amp; Fluid Flow, Vol. 10, pp. 842861.
layer flows, measurement and modeling, enhanced heat transfer and convective heat transfer. Dr. Yemenici is the member of Chamber of Mechanical Engineers. This file has been shared by a user of PDF Archive. Document ID: 00172466.